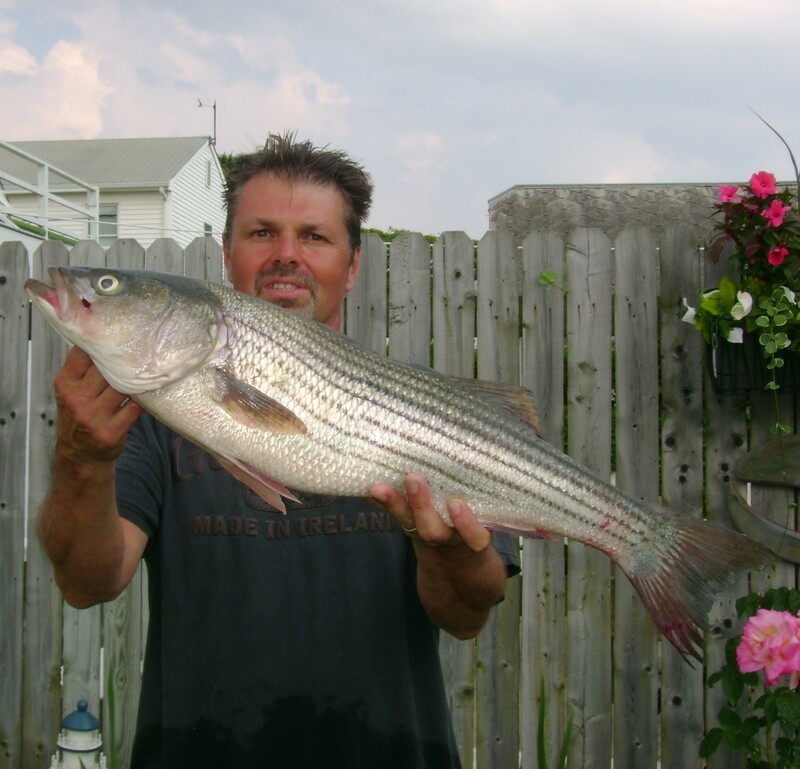 This article gives you some helpful tips on surf fishing for stripers. 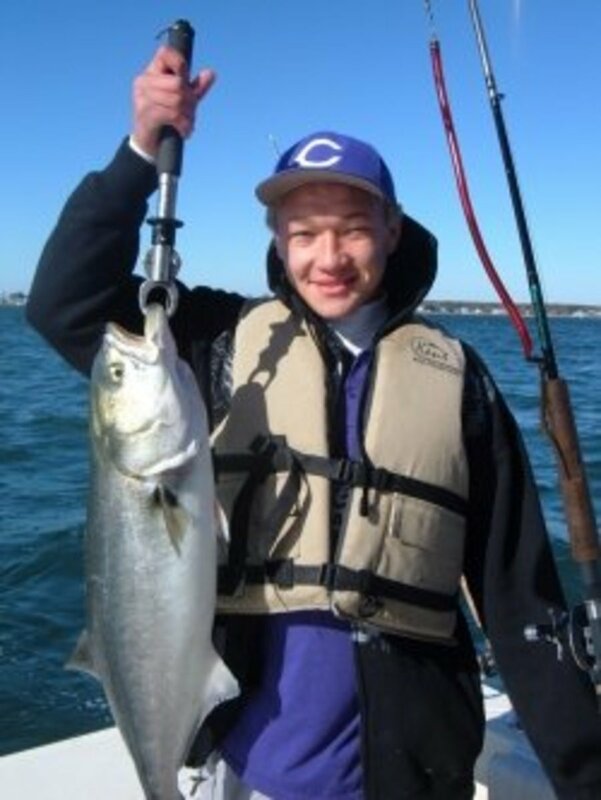 The Striped Bass or “Striper” is the top salt water trophy fish in the Northeast region. Depending on the season, you will find stripers all along the eastern coast from Main to Georgia. 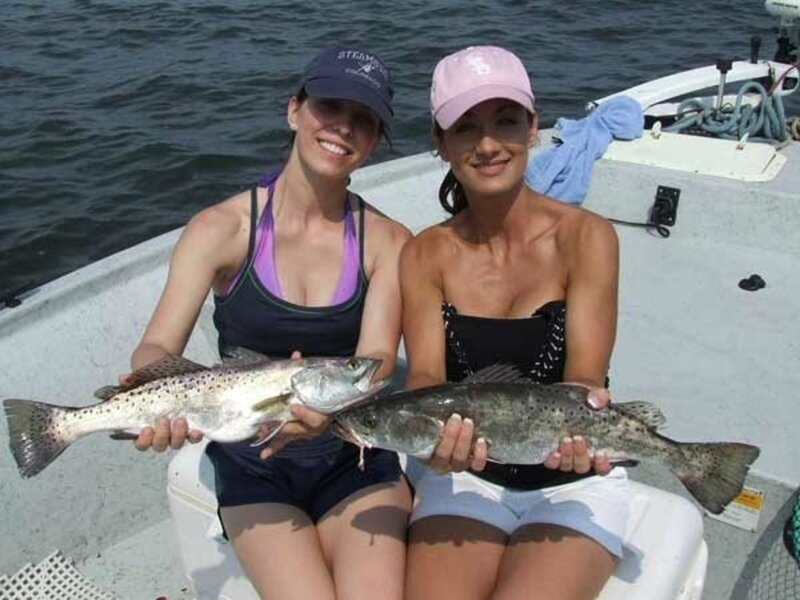 My fishing experience is limited to the beaches of South Jersey, where striper fishing peaks in the spring and fall months. 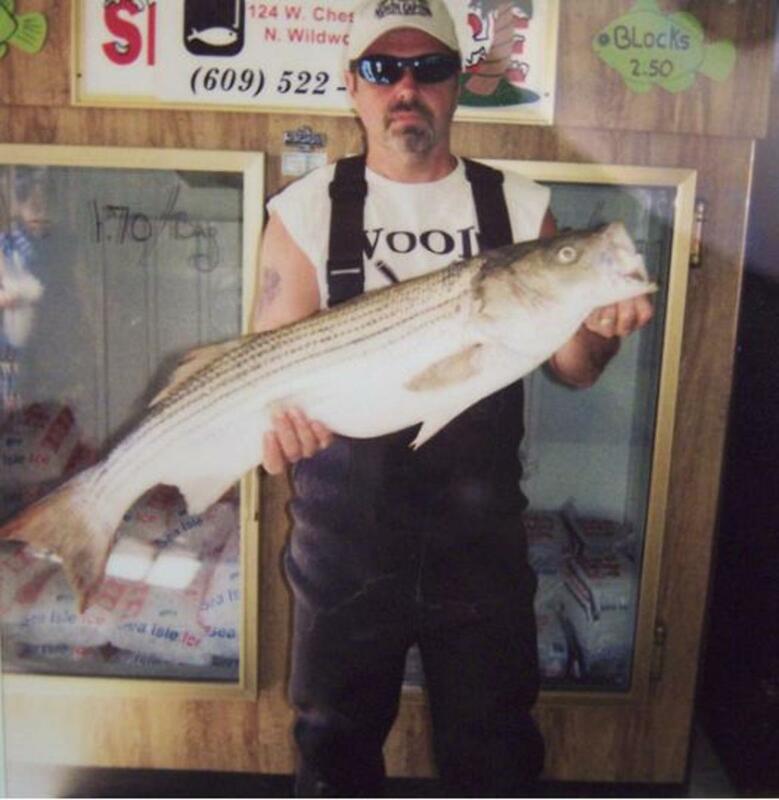 This is because the striper is a migratory fish seeking water temperatures between 45 and 65 degrees. In the spring they are heading north looking for cooler waters and in the fall they are headed south seeking warmer waters. If water temperatures remain cool throughout the summer months, you may just get lucky and land one as late as July. So there is the first lesson: your best opportunity for catching a striper is when the water temperature is between 45 and 65 degrees. Although I have caught some stripers using eels, I have had the most success using clams, and believe me, clams are a lot easier to handle than eels. Most bait and tackle shops in the coastal communities will have ample supplies of fresh clam. Worst case scenario: if they are out of fresh clam, go with the frozen clam. What you want to avoid is old clam that is beginning to spoil. If you’re fishing with old clam you’re just wasting your time, the only fish you’re going to catch with old clam will be sand sharks and skates. How you bait your hook with the clam can also make a difference. I generally use a half clam and a #8/0 circle hook. To start, cut the tongue of the clam, actually the “foot,” right down the center lengthwise. Also, cut the tube-like siphon, which is the neck, in half, and leave a length of the long string-like membrane on each half. Weave the hook through the tongue three or four times and then put the hook through the neck. The last step is to push the hook through the membrane material a few times. The membrane material’s outer edge, the brown part, is tougher than the tongue and neck, and by passing the hook through this material, you will secure the clam to the hook. In rough waters it may be necessary to wrap a few strands of elastic string around the clam just to hold it in place. You can also use rubber bands if you don’t have the elastic clam string; both will work fine. 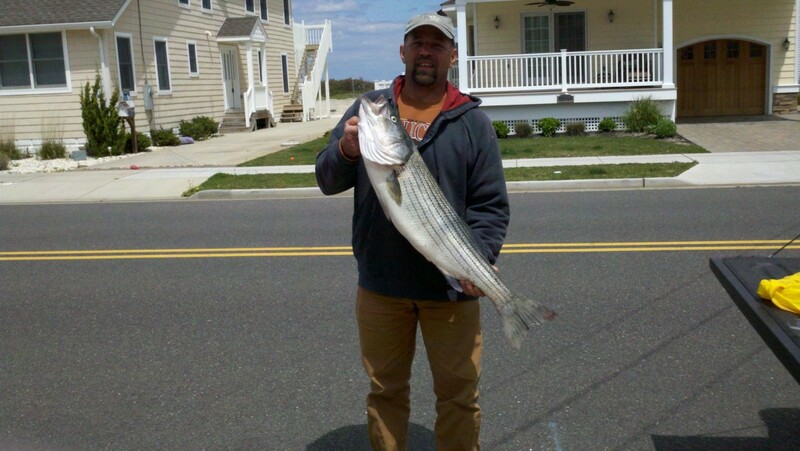 You want to make sure your fishing rod is sturdy enough to hold up under the stress of pulling in a large striper. The smallest rod I would recommend using would be a 9- to 10-foot surf rod. You can go smaller, but you run the risk of hooking up with a nice sized cow that has the ability to break your rod in half. In addition, a larger rod will enable you to cast the same amount of weight further than you could using a smaller rod. But keep in mind, the goal is not to see how far you can cast but to cast to the desired location. Also, keep in mind that as the tide comes in, that sweet spot starts to get further away. You should be able to pick up a quality surf rod for under $50. In my experience, the fish has no idea what you paid for the rod. I’ve never paid over $40 for a rod and have caught plenty of fish. Although the selection of the rod and reel are both important decisions, I believe the reel selection is more critical than the rod selection. You should be using a saltwater spinning reel, one that is sturdy enough to pull in a 20-25 lb fish. A top notch reel can cost you well over $100. I generally pay about $35-$45 for a reel. The reel capacity should be no less than 100 yards of 30-lb tackle. Always rinse your reel off with fresh water after use to wash off the saltwater and sand. Saltwater is extremely corrosive and can quickly ruin a reel. For tackle, you can go with 17-20 lb test monofilament line. In most cases this will work fine. I use 50-lb test braided tackle, which is about the thickness of 8-lb test monofilament. I can get about 300 yards on my reel. The fact is, I may never need 300 yards but it’s nice to know it’s there if I need it. Although braided line is more expensive than monofilament, it is worth the extra cost. And although 50-lb test may be considered overkill, I have on occasion hooked into some large drum fish that would have pushed 17-lb test mono filament to the limit. To me, it’s not worth losing a fish over a few extra dollars. There are several options to choose from when it comes to the rig. You have the fish finder, the top/bottom and the standard hook and sinker, just to name a few. I use a “modified” fish finder rig. This rig allows the striper to take the bait and begin to swim away; however, after taking the bait only 2-3 feet, the line is stopped by the sinker and the hook is hopefully set. Here is how to set it up: at the end of your line tie on a snap swivel. Make sure you have a bead between the snap swivel and the eyelet at the end of the rod. Next take a 3-foot length of 50-lb monofilament line and slide on a bead, followed by a sinker slide, followed by a bead. To one end tie a snap swivel and to the other end tie a barrel swivel. Attach the end with the barrel swivel to the snap swivel on the rod, and attach the end with the snap swivel to your hook. The leader on the hook should be about 12” with a barrel swivel on the end. The snap and barrel swivels should be at least the same strength in pounds as your line strength. And that’s it. You now have what I refer to as the modified fish finder rig. When using this rig, cast to your desired location and then reel the line in until you feel the resistance of the sinker. Your line should be reasonably tight at this point. 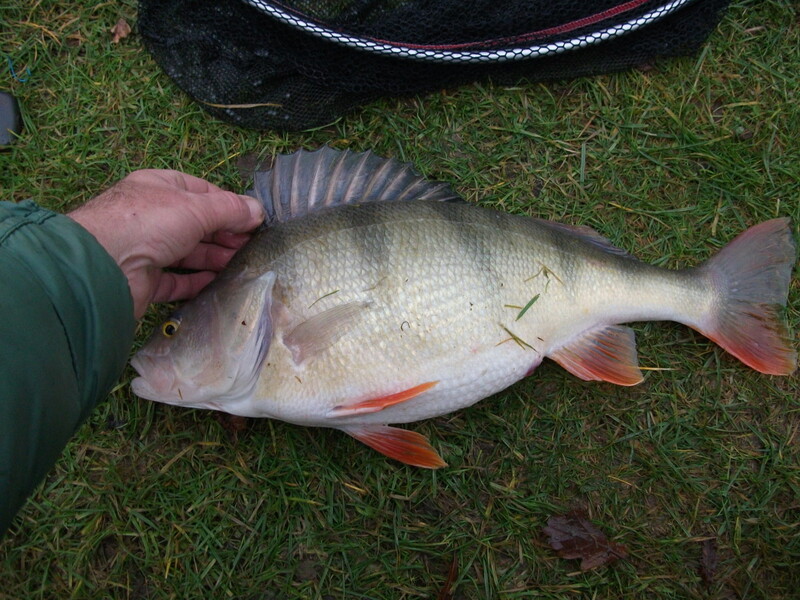 What you have just done is positioned your bait at the end of the 3 foot section of line holding the sinker. Now loosen your drag so that line can be taken with little to no resistance. Water conditions will determine how much weight you need to hold bottom. I generally use a 4 oz bottom holding sinker, often referred to as a sputnik, for its uncanny resemblance to the Soviet Union’s first satellite, the Sputnik-1. When the striper takes the bait, the line will freely be released until the bead hits the sinker. At this point the hook should set and you are ready to reel in your fish. Just a note on reeling in the striper. You’ll need to tighten your drag to a point where the striper can still take line out, but not easily. The fish may run for a bit taking line and then stop or it may swim in towards shore. When the fish stops or comes towards the shore reel in as much line as you can. 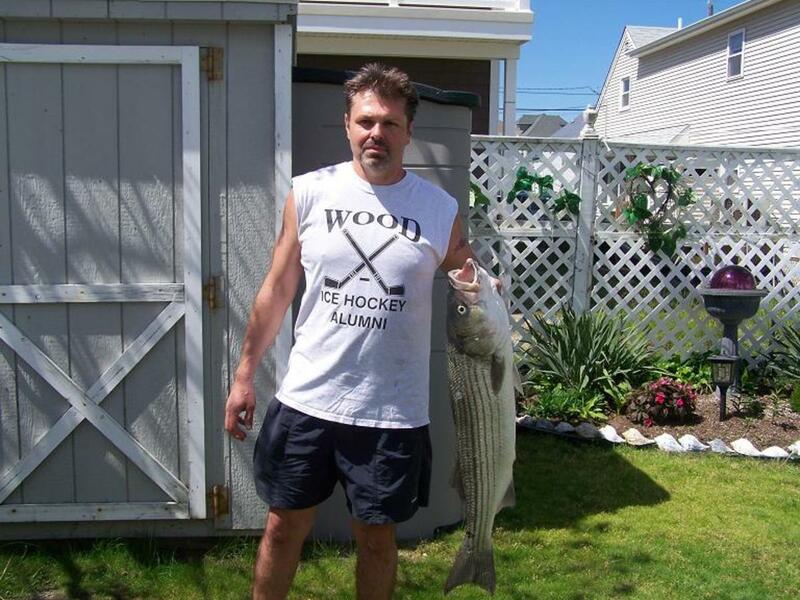 Eventually you will have reeled the striper into shallow water. At this point start walking backwards and “beach” the fish. Once the fish is safely beached, you can then retrieve it. I’ve seen several fish lost when the fisherman attempted to retrieve the fish before it was safely beached. Stripers generally feed when there is water movement. The water movement that occurs as a result of the changing of the tide stirs up sediments, which small bait fish such as minnows and spearing feed on. 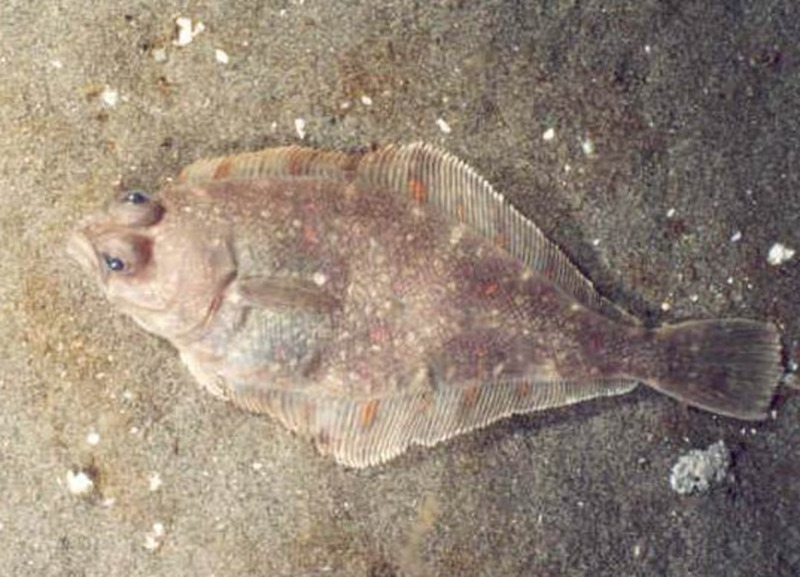 The minnows and spearing attract larger fish like the striper. I can’t really say whether an incoming tide is better than an outgoing tide or vice versa; however I can tell you that either one is superior to a slack tide. 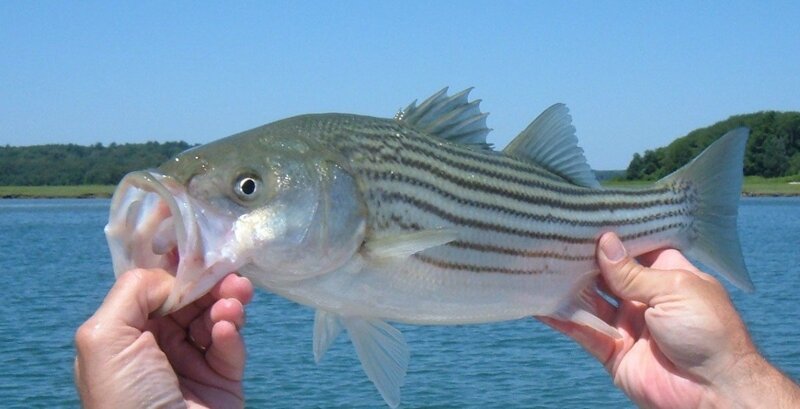 In addition to the tides, wind direction can have an impact on the striper's feeding habits. I have found that your chances of catching a striper improve when there is a sea breeze (a wind coming in off the water), as opposed to a land breeze (a wind coming from the land towards the water). My understanding of this phenomenon is that the sea breeze in some way creates water movement that drives the sediments and thus the bait fish towards the shoreline, and where there are bait fish there are stripers. Stripers are most actively feeding at both dawn and dusk. Keep in mind that stripers are a predatory fish and use the cover of darkness to their advantage. As the sky begins to lighten, just prior to sunrise, stripers sense that it will soon be light and the advantage they achieve under the cover of darkness will soon be lost. As a result their feeding activity increases. As the sun goes down the stripers begin to sense that it will soon be dark and they go into feeding mode. So, to increase your chances of catching a striper, pay attention to the tides, the wind and the time of day. Keep in mind however these are suggestions as to how you can increase your chances of catching a striper. I have caught stripers at slack tide at mid-day with no wind. Sometimes it’s just a matter of having your bait sitting right in the path of a hungry fish. In real estate you’ve probably heard the rule "location, location, location." Well when it comes to catching a striper, the same rule applies. One way to find out is to check out the beach at low tide. At low tide, channels and sandbars are much easier to spot. Another way is to look for waves breaking several yards off of the beach. A sandbar will cause waves to break as they pass over it. On the beach side of the sand bar there is either a channel or a hole. The ideal place to cast is just in front of the sand bar on the beach side. This is usually the deepest point and the area where most of the sediments end up. The other way to identify a good location is what I refer to as the common-sense method. If the majority of the beach front is desolate, but a small stretch of beach is packed with fishermen, chances are, that stretch is a good spot. You may not be able to stake a claim due to overcrowding, but you should be able to get out early the next day and stake your claim. The final way I find good locations is to just ask around. Some fisherman will share information about good spots with you, some won’t. I personally don’t mind sharing information. If I give you a tip on a hot spot and you catch a striper, good for you. Hot spots don’t stay a secret very long; word travels fast, so I just go with the flow. If a spot is packed by 7:00 AM, I’ll show up at 6:00, if it’s packed at 6:00, I’ll get there at 5:00 and so on. So there you have it. If you follow this advice you will increase your chances of catching a striper from the beach. If you’re not having much luck, try not to get discouraged, sometimes things like this just take time. I’ve been in situations where everyone around me is catching stripers and I’m not even getting a bite to where I was the only one to catch a striper. The point is, you can only control so much. Follow these suggestions and you will have as good a chance as anyone around you of catching a striper. After that, it’s up to the fishing gods. Good Luck. Cool! I can't imagine how good it is to catch a big fish like that. Thanks JSMatthew, I appreciate the positive feed back. I know when I started fishing for stripers I made a lot of mistakes. Over the years I've learned a lot, mostly from other fishermen. Glad you found it useful. Yea, I guess catching a stripper would tend to got more attention than catching a striper. Great Hub! I am bookmarking for future reference. Voted Up and Useful. I'll be honest, I read this as "How to catch a Stripper" and curiousity got the better of me. However, this Hub looks very informative, so well done!